New-Skin Liquid Spray Bandage provides flexible, antiseptic treatment for larger wounds, such as those on legs and arms, and prevents blisters and calluses in hard-to-reach areas on the body. New-Skin dries rapidly to form a tough protective cover that is waterproof and keeps out dirt and germs while letting skin breathe. 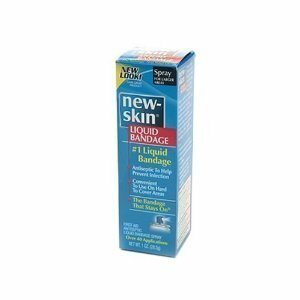 For smaller affected areas, try New-Skin Liquid Bandage.